How many records have you broken in your lifetime? Post subject: Re: How many records have you broken in your lifetime? I’m bumping this old thread again to show you a photo of one of the worst accidents I had with 78s. This was taken in June of 2016. And since then I’ve only replaced one of the records and of course it was the most boring title of the lot. I in the past 51 years I have been collecting 78s, I can count a half dozen accidental breakages. The most memorable was in 1972 dropping a heavy paper punch onto a Victor 1918 set entitled "First Aid French for American Soldiers". Each record exhibited a crack but they were still playable. It is interesting that through the many thousands of records I have gone though since 1972, I have never come across another set. The English to French translations are hilarious. These were supposed to provide useful spoken phrases and my favorite is "Look out, a shell"! 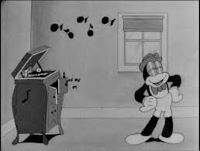 Well I found a few black wax cylinder broken and don't remember doing it so perhaps someone is sneaking into my place when I'm not around. Yes one was a favorites. Title something like Bill I always remember Bill. I still have it and think of a friend that died at 36 from a brain hemorrhage named Bill. I have broken one or two 78s that I loved. Bob Hope singing Thanks for the Memory (I have a second copy) and an organists playing to raise funds for Africa but his name escapes me. Well known though. Never saw another record by him since in 36 years of looking. I recently cracked my copy of Chip Of The Block by Helen Trix by pushing the record too far on the mandrel. I had rotator surgery a few years ago. When I reached a point in my recovery my surgeon said I could return to the pool but I could not use my repaired shoulder. When I race I am primarily a back stroker and I found I could swim in a straight line by watching the ceiling and making small corrections. I entered a Masters swim meet and raced the 100 & 200 yard backstroke. The last pool length of my first race I heard the crowd cheering for the one arm backstroker that beat the two female swimmers in that heat. A friend said I probably broke the record for the one armed bald headed 200 yard backstroke. Does this count for a broken record? It still sickens me that I cracked my one and only copy on the Zonophone label of "'Leven Thirty Saturday Night" by the Arcadians Dance Orchestra. I had searched for a long time for that disc, finally procuring it from a collector in Scotland. This happened as I was returning the disc to one of the milk crates I store some records in. While not a true break, it surely did break my heart!